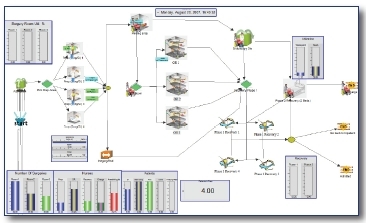 Increase the business transaction efficiency using dynamic simulation software - Simcad Pro. Using Simcad Pro’s patented dynamic simulation engine allows managers, supervisors and other process improvement experts to perform analysis, detect delays within the system, and generate real solutions. Users of Simcad Pro Simulation Software have the ability to collaborate together on models, making notes and annotations to share important information and changes. Users can perform “what-if” scenarios to show how different changes affect the system as a whole, prepare for different situations, or look for more efficient solutions. Transaction Simulation Made Easy with Simcad Pro. Users can manipulate the model in order to come up with the best and most efficient way to handle transactions within the business. Users can change pathways and processes that transactions take in order to see how these changes affect the system overall. Users can rework flows and processes, including adding and deleting processes to find optimal scenarios. Simcad Pro Simulation Software gives users the freedom to experiment with different situations and learn their impacts and effects before spending time and money to implement them in real-life. Due to the high variability of transaction types presented within a business, it is important to utilize all available data to generate accurate mathematical figures from the model. 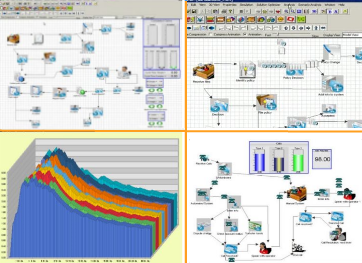 Through Simcad Pro Simulation Software, the user can import historical data from different business processes from external data sources, as well as import live data into the model. Simcad Pro Simulation Software uses actual data from within the business, ensuring that calculated data is reliable and accurate. Additionally, CAD layouts can be imported to the model and distances will automatically be calculated. 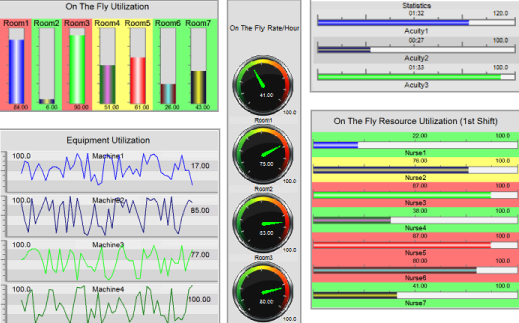 The “Simulation Analysis Report” provides users with a quick analysis of the model. This report includes information about poorly performing areas for resources and processes. The report also provides reasons for why these problems are occurring, helping the user generate possible solutions. Different parameters can be altered within the model, including resources, capacity, timing, etc… by importing information from an external data source or inputting them manually. While the model is running, users are able to visualize where transaction backups are occurring within the business. Changes can be made to the number of stations, flow of information, number of workers, etc… in order to find the optimal environment. As changes are made to the model, users are able to see how they affect processes downstream, getting an accurate and complete picture of the entire business.